One minute your dog is taking in the mouth-watering smells of grilling (and maybe even a few sneaky morsels from your guests) and the next minute they’re in a warzone. If only we could explain to our precious pooches that the fireworks are part of a happy and fun celebration and are temporary. Unfortunately, they just don’t understand where the loud booms are coming from and why. Some dogs don’t seem to mind, but others panic. If your dog struggles on the 4th, check out the tips and tools below to help calm your dog during the fireworks. If your dog is enjoying the calm sleepiness that comes from a day filled with exercise, they are less likely to react to the fireworks. Ideally, they may even sleep through them! If you’re free on the 4th, plan an adventurous hike, long walk, or a few fun play sessions that get your dog moving. This way, you can help your dog expend some of the energy that would be devoted to feeding their anxiety during the fireworks. If you’ll be preparing for a holiday celebration or aren’t free, a day of daycare is a great way to exercise your dog. Cold Nose Lodge has regular full and half days available on the 3rd and full days with drop off between 8-10 AM and pick up between 4-6 PM on the 4th. Many dogs will instinctively seek out small enclosed spaces when they’re feeling anxious. Does your dog see their crate as their personal space/den? It’s a good idea to leave the crate door open so that they can retreat to this spot where they feel protected if necessary. Covering the crate with a blanket (leaving an opening for the door) and making sure the inside of the crate is comfortable with familiar blankets can help your dog see their crate as a safe place to wait out the fireworks. Keeping your windows, blinds, and curtains closed during the fireworks can help your dog to feel safer as well. This way, any visual stimulation is removed. When your dog is in the throes of fireworks anxiety, the less reminders of what’s going on outside, the better. This also helps to prevent dogs from looking out the window, searching for the source of the noise. A dog that would normally never try to escape may bolt out of fear when they hear booming fireworks. We see it happen every year. Be careful when opening and closing your doors. When taking your dog outside to use the bathroom, your best bet is to keep them on leash after dark so that they’re unable to bolt. Be aware that people may be setting off fireworks after dark on the days and weekend leading up to and following the 4th as well. Accidents do happen so make sure that your dog is wearing proper identification so that they can be reunited with you as soon as possible if they happen to escape. One of the best thing you can do to help alleviate your dog’s anxiety is keep them company. Whether this means physically being with your dog or hiring a sitter, cuddling is often the best medicine. Making your couch extra comfy with pillows and blankets, and watching a movie with your dog cuddled by your side is a great plan. Treat them to a special chew or irresistible stuffed Kong that’s filled with their favorite flavor – whether that’s wet food, pumpkin, or peanut butter. There are some great natural supplements out there to help ease canine anxiety. However, many of these supplements have a cumulative calming effect and therefore take weeks of supplementation to see results. The short weeks are definitely worth the wait and supplements like Herbsmith’s Calm Shen can be life-changing. When you don’t have the time to wait, there are supplements that can be used short-term and that are immediately effective. Herbsmith’s July Third is a great example. As you can see from the name, it’s specifically formulated to be used the day before/on the day of stressful situations. 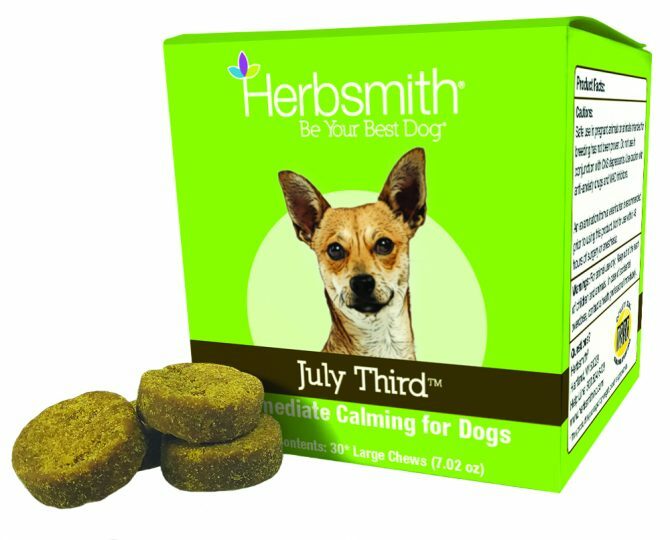 Cold Nose Lodge carries Herbsmith’s July Third if you’re interested in picking it up for your pup! We also have other supplement options available and would be happy to direct you to the best match for your pup when you stop in. You can also visit your vet to express your concerns about your dog’s anxiety during fireworks. If they see fit, they will be able to prescribe medication to help calm them on the 4th. Throughout their lives, dogs continue to recognize the pheromone emitted by mother dogs that calmed them as a puppy. This pheromone gives them a sense of security and comfort. There are calming aids that replicate this pheromone and are proven to help reduce stress. At the Lodge, we carry both Adaptil (in spray and diffuser form) as well as Sentry calming collars and drops. We use Adaptil as a Fear Free calming tool at the Lodge for special cases where dogs are feeling nervous upon arrival or while in the playroom. We’ve seen great results. A compression wrap like a Thundershirt can bring a dog comfort during the fireworks. Think of it like a hug! The gentle, constant pressure has a calming effect on many dogs. Thundershirts come in all sizes from XXS to XXL. If you’d like to purchase a Thundershirt to help calm your dog, stop into the Lodge. Bring your pup along! We’re happy to show you how to put it on your dog with the correct amount of pressure to alleviate anxiety. Through a Dog’s Ear is a musical collection that is also created to resonate specifically with the canine nervous system. If you’re looking for something handy to play, Pop, Country, and Classical music are all great for calming your dog and help distract from the noise outside.